Gustavus is proud to announce four internship positions with the Mayo Innovation Scholar Program. The internships are designed to give students first-hand research and marketability experience with leading inventors and researchers employed by Mayo. For more information about the program, please visit www.mnprivatecolleges.org/members/mayo-innovation-scholars. You may also make an appointment to see Vince Thomas (vthomas@gusatvus.edu, 507-933-7509) or Corrie Odland (codland@gustavus.edu, 507-933-7532) in the Gustavus Center for Servant Leadership to learn more details about this opportunity. A great way to learn about organismal diversity is to work with a specimen collection. The Gustavus Biology Department has several opportunities to work with plant and animal collections! In order to share our insect, plant, and vertebrate collections with a larger community we are in the process of organizing and displaying information, including images, about the specimens in our collections on a newly-designed website. This site will serve as a resource for classes at Gustavus, the St. Peter community, and scientists. 3. Three copies of the proposal are due to Eric Elias (NHS 221B) by 5:00 PM Friday, September 23, 2016. Successful applicants will be notified the following week. Eligibility: Any undergraduate majoring in one of the natural sciences, mathematics, or psychology. Deadlines: The Fall deadline is usually near 20 September, spring deadlines vary. Watch for announcements. Obligations: An oral presentation or a poster of the research accomplished must be given at the spring undergraduate research symposium held on the Gustavus campus. Grant Size: While the committee will entertain any justified request, the usual maximum is $500.00. These funds are expected to be used for purchasing supplies that are not routinely available in the department. Detailed budget, including why each item requested is essential for the research project. Budget items that are not acceptable include stipends, mileage and poster printing. The budget will appear on a separate page. Projects using human or vertebrate animal participants must also provide proof of IRB or IACUC approval before Sigma Xi funds can be used. You will do the actual writing of the proposal but it is quite acceptable for you to seek advice from your faculty mentor in the early drafts and in the final revision. The online submission form, located at https://gustavus.edu/forms/sigma-xi-research-proposal, will prompt you for the proposal title, the student(s) applying, and the faculty mentor. The proposal should be a single PDF document. In the main body of the proposal, explain the proposed work and place it into the context of what is presently known. Explain what experiments you plan to do and their anticipated outcomes. Do not assume that the evaluators are familiar with your research area. The committee will give priority to those proposals that state a clear research goal that attempts to answer a question. Proposals seeking funds for repeating the work of others will be funded only if the work is appropriate to longer range research projects. Any proposal that does not follow these guidelines will be returned without review. Support your grant request with a detailed budget. The budget page will contain a carefully prepared itemization of the costs you believe will be encountered. Justification for each item in the budget is required. Some freedom exists to change budget lines later but you should, in this proposal, defend the use of the materials. Equipment purchases must have a separate justification. Stipends are not allowed. Only in rare instances will funding be approved for paying subjects who participate in a research project. Submit all proposals via the online submission form located at https://gustavus.edu/forms/sigma-xi-research-proposal. Incomplete proposals (missing one of the five sections listed above) will not be considered. Paper copies will not be accepted. The committee will respond as quickly as possible, but no later than two weeks after your submission. Please note that some faculty have some independent study funds available to them so it may not be necessary to wait for a response from the committee in order to begin the research project. Occasionally, a proposal will need to be revised and submitted for a second review. The First-Year Research Experience (FYRE) Program is dedicated to providing opportunities for students to engage in bona fideresearch experiences during the summer between their first and second years with a Gustavus faculty mentor in the Natural Sciences and Mathematics. This program was initially developed and supported with funds from a Howard Hughes Medical Institute (HHMI) grant that aimed to improve the learning experiences for students interested in biology and/or chemistry early in their undergraduate careers. Following the four-year period of the HHMI grant award, in which students and faculty alike observed large, positive impacts of these early research experiences on the development of the students' learning and research skills and careers, Gustavus has committed to the continuation of the FYRE program into the future. Learn about the types of research projects offered in this program here. (Application instructions are at this page). - Search 'SURP university' on Google to find other opportunities. SURP stands for 'summer undergraduate research program'. - Summer Undergraduate Research Fellowship (SURF): The National Institute of Standards and Technology offers the SURF program for students majoring in science, mathematics, or engineering. The application includes a portion completed by an institutional representative and a set of materials provided by student applicants. For more information, see http://www.nist.gov/surfgaithersburg/. Bob Weisenfeld serves as the institutional representative and is available to assist students in proposal preparation. He can be reached at x7049 or bweis@gustavus.edu. Opportunities exist in ecology, chemistry, genetics, cell biology, aquatic biology, conservation, physiology, entomology, plant biology, behavior, neuroscience ...the sky is the limit. You get to interact with other undergrads, researchers, grad students, post-docs, etc. They pay a stipend, living expenses and generally take you to a national meeting. Deadlines for applications range from early January to mid-March. - Cast a broad net, geographically and biologically. Places on the coast, prestigious universities or beautiful locales are highly competitive, as are ones that explicitly mention medicine. See the opportunities in other possibilities. - You have a better chance if you talk about what skills you bring to the program not just what you will get out of it. Think about what are you interested in and what might you do while you are there. This means you need to do your homework and see what kinds of projects different professors do and how it intersects with your interests. Be specific. Articulating a potential project does not mean you are locked into doing it, rather you are showing the selection committee that you are capable of acting and thinking like a scientist. - Juniors have a better chance than sophomores, but don't let that dissuade you from trying. Follow the link to the Department of Biology's web page. There you will be able to find links to summer undergraduate research programs, courses, and biology and science organization's websites. Undergraduates will participate in an intensive, 10-week program in ecological research that integrates multiple disciplines and approaches. Students will develop an independent research project in an area of their interest through collaboration with a mentor. Previous research has included forest and wetland ecology, invasive species, river ecosystem health, and the effects of land-use change on soil and plants. Participants will receive training in techniques necessary to carry out their research, as well as engage in weekly talks about broader scientific topics and ethical practices. 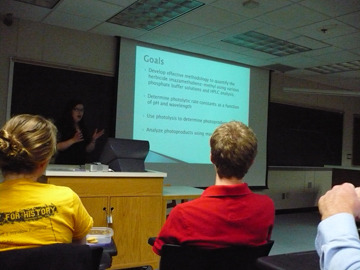 Projects will culminate in a final report and presentation of results at an end-of-summer scientific colloquium. Students will receive a $4000 fellowship stipend, $1000 food stipend, free on-campus housing, and travel funds. Minority and female students are strongly encouraged to apply. More information is available on this website http://www.bradley.edu/academics/las/bio/research/REUHome.htm or by contacting Sherri Morris at sjmorris@bradley.edu. We are looking for undergraduates who have a strong interest in ecology or forestry to participate in an NSF funded project in the New Jersey pine barrens and in commercial forests in Finland. The object of the project is to provide education and research experience to undergraduate students by becoming involved in parts of two projects investigating the effects of forest manipulations on forest floor vegetation and changes in soil processes. The project is related to a tree thinning and experimental forest floor manipulations in the NJ pine barrens designed to convert the understory from an ericaceous shrub community to one dominated by grasses and sedges. The project in Finland is related to forest harvesting and the removal of non-timber post-harvest residues for biofuels. Students will be expected to attend meetings in Rutgers University in the spring of each year to get to know each other and to learn about the details of the projects and life and forestry in Finland. During the summer, students will spend time in Finland to participate in the research there and time in the NJ pine barrens in the spring and fall participating in the project there. Each student will have a specific sub-set of research protocols to focus on, but all will be made aware of the overall research agenda. The Harvard Forest Summer Research Program in Ecology is an opportunity for students to participate in 11 weeks of mentored, paid, independent research focusing on the effects of natural and human disturbances on forest ecosystems, including global climate change, hurricanes, forest harvesting, wildlife dynamics, biodiversity and invasive organisms. Learn more about this year's projects. The Harvard Forest is located in the town of Petersham, in Western Massachusetts. NSF-REU site on Structure and Function of Proteins. Applicants must be US citizens or Permanent Residents (Green Card). Students must have completed an Organic Chemistry or Biochemistry sequence before the summer. All participants receive a stipend, free housing, food allowance and travel expenses. Neither the University of South Alabama nor the National Science Foundation can provide health insurance to participants in the program. All participants are fully responsible for their own health insurance coverage. RISE is jointly sponsored by two of the nation's leading public research institutions -- Rutgers, the State University of New Jersey and the University of Medicine & Dentistry of New Jersey (UMDNJ). We have a vibrant campus, conveniently located only an hour from New York City and Philadelphia. We choose 30 outstanding college undergraduates to participate in cutting edge research in the sciences, math, and engineering under the guidance of prominent faculty mentors. You earn a substantial stipend and live in free on-campus housing. For mor information visit http://rise.rutgers.edu. Exciting Science: Our research spans the biomedical, physical and behavioral sciences, math, and engineering. In the biosciences, we offer an umbrella program, http://lifesci.rutgers.edu/~molbiosci/, and are home to the Cancer Institute of New Jersey and the Stem Cell Institute of New Jersey. Cutting-edge interdisciplinary opportunities include three IGERT programs: NanoPharmaceutical Science & Engineering, http://igertnanopharma.rutgers.edu/, and Perceptual Sciences, http://perceptualscience.rutgers.edu/. We also offer strong programs in environmental and marine sciences, food and nutritional sciences, and ecology. Admission to RISE is highly competitive. There is a target deadline for February 18, 2014, but the applications will be accepted and reviewed until all out places are filled. Are you interested in conducting research at the US Department of Energy's largest multi-purpose laboratory? Do you know someone who would be an excellent intern, participating in world-class research with world-class scientists? Would you like to get paid to learn? Are you interested in expanding your resumé? Would you like to gain research experience before entering the workforce or graduate school? Must have earned a high school diploma or GED - Must be at least 18 years old at the start of the program - Must have completed at least one semester of college - Must have a minimum 2.5 out of 4.0 GPA - Must be a United States Citizen or Legal Permanent Resident - Must have coverage under a health insurance plan. It is the responsibility of each participant to secure insurance coverage before arriving at the appointment site. The SURF provides college students, who have demonstrated an interest in science, with the opportunity to experience research. It is designed to increase student motivation to pursue graduate education leading to science careers. Under the guidance of a faculty mentor, each student has the opportunity to learn the basic skills necessary to contribute to a research effort. SURF is a 10 week program which runs from the first week of June to the first week of August. The program is offered to college students who are U.S. citizens or permanent residents and who are contemplating graduate studies in the sciences. Preference is given to women and minority students, to students at community colleges and primarily at undergraduate institutions. There is a total stipend of $4,600 (before taxes) for the ten weeks of the program. Partial travel allowance is paid along with food subsidy. For more information visit http://www.sci.tamucc.edu/surf/. Students with a strong interest in graduate programs are particularly encouraged to apply. Applications Due: February 17, 2014. Undergraduate Fellows receive summer stipends of $5000, in addition to free University housing, and during the academic year they can also be paid up to $5000. To be eligible for the Fellowships, students must be involved in research in Biology or Environmental Science with a participating faculty member. Graduate Fellows must be accepted into the Biology Department Graduate Program. All NSF GK-12 Fellows must be citizens, nationals, or permanent residents of the United States. The SJU GK-12 and LINKS program involves a partnership with the Wagner Free Institute of Science (WFIS) as well as the School District of Philadelphia. Fellows will work with WFIS children’s educators and elementary school teachers to develop and present science lessons to children in grades 1-6. The lessons are organized into semester-long units, generally with Environmental Science themes. Fellows and their SJU faculty mentors serve as content resources for the WFIS educators and the public school teachers, and they are role models and teachers for the children. WFIS educators and public school teachers help Fellows become familiar with pedagogical methods in K-6 education and with the special educational needs of urban minority children. No prior experience with K-6 education is required, but reliability, flexibility, and a willingness to work as part of a multidisciplinary, multicultural team are necessary. RIT offers paid internships in fields related to genomics and bioinformatics, immunology, ecology, and the like. For more information visithttp://people.rit.edu/gtfsbi/Symp/summer.htm. Get laboratory experience in biotechnology and get paid. Accepted students will spend the summer at Western Kentucky University in Bowling Green, Kentucky and be trained in research techniques, participate in exciting research (students can chose from over nineteen projects), and gain valuable presentation skills. Additionally, students will benefit from a series of workshops exploring ethics and preparing students to apply for and succeed in graduate school. Students will receive a stipend of $500 per week, free housing, meal and travel allowances, and lab supplies..
Students can find more information and application instructions at http://www.wku.edu/biotechreu. WKU will not be hosting the Biotech REU in Summer 2013. Please check back in 2014 for updates. Visit http://www.pathwaystoscience.org/programs.asp?descriptorhub=SummerResearch_Summer%20Research%20Opportunity to explore internships or research opportunities available for Summer 2014. This site is sponsored by NSF and NASA. The Sanford Program for Undergraduate Research (SPUR) is a program for undergraduates. Other than just doing research students will have the opportunity to interact with other trainees as well as mentors supervising their projects. They must be sophomores or juniors when they apply, be majoring in the biological or chemical sciences, interested in obtaining a Ph.D., and have a GPA of 3.0 or higher. A $400/week stipend plus free board is provided. Applicants will be evaluated on their enthusiasm for research, two letters of reference, their college transcript, and previous research experience (which includes science courses that have a lab component). For more information or to apply, visit the link provided. Summer Undergraduate Research Experience (SURE) This is a unique research experience offered to American Indian students that offers students an opportunity to explore their interest in pursuing careers in the health science professions and in health disparities research. For more information or to apply, visit the link provided. The SD BRIN has opportunities for undergraduates to assist in research projects all over South Dakota. The application process requires that the student be an undergraduate (priority given to juniors and sophomores but first years are welcome to apply), a GPA of 3.0 or higher, a personal statement, and a letter of recommendation. For more information visit https://sites.google.com/a/usd.edu/brin/. The National Heart Lung and Blood Institute and the National Center for Research Resources cosponsor this summer program at eight different colleges and universities throughout the country. The program is a comprehensive six/seven week course and hopes to address the growing imbalance between the demand for biostatisticians and the supply. For more information you can visit the National Heart Lung and Blood Institute's website: http://www.nhlbi.nih.gov/funding/training/redbook/sibsweb.htm. More information about programs, applications and dates are available through the individual schools (listed on webpage).